Grant (ankle) has been ruled out for Sunday's game against the Raiders, Zak Keefer of The Indianapolis Star reports. Analysis: With Grant out, T.Y. Hilton and Chester Rogers are in line to head the Colts' Week 8 wideout corps, with Dontrelle Inman and Zach Pascal (head) candidates to see added snaps in the team's passing offense this weekend. Grant (ankle) didn't practice Thursday. Analysis: Grant is thus trending toward inactive status Sunday against the Raiders. If that ends up being the case, T.Y. Hilton and Chester Rogers would head the Colts' Week 8 wideout corps, with Dontrelle Inman and Zach Pascal candidates to see added snaps in the team's passing offense this weekend. Grant (ankle) wasn't spotted at practice Wednesday, Kevin Bowen of 1070 The Fan Indianapolis reports. Analysis: Grant's status for Sunday's game against the Raiders thus remains cloudy with the wideout having yet to resume taking contact. If Grant is forced to miss a second straight contest, Dontrelle Inman and Zach Pascal could both be in store for elevated roles alongside T.Y. Hilton and Chester Rogers. Grant (ankle) has been ruled out for Sunday's game against the Bills, Kevin Bowen of 1070 The Fan Indianapolis reports. Analysis: Grant's absence will be cushioned by the return of T.Y. Hilton (hamstring) from a two-game absence. Though Hilton is expected to act as quarterback Andrew Luck's top target in Week 7, Chester Rogers and Zach Pascal could still earn ample snaps with Grant out of the picture. Grant (ankle) wasn't present for Thursday's practice, Kevin Bowen of 1070 The Fan Indianapolis reports. Grant (ankle) was absent from practice Wednesday, Kevin Bowen of 1070 The Fan Indianapolis reports. Analysis: Grant still has some time to return to the practice field before Sunday's game against the Bills, but for now his status is cloudy. On the plus side from the Colts' perspective, top wideout T.Y. Hilton (hamstring) was able to practice Wednesday, offering hope that he'll be ready to return this week after a two-game absence. 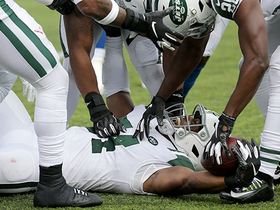 Grant (ankle) exited Sunday's game against the Jets after suffering an ankle injury. Analysis: Prior to his exit, Grant had caught two of his five targets for 24 yards. With T.Y. Hilton (hamstring) already out, the Colts' Week 6 wideout corps is now headed by Chester Rogers, Zach Pascal and Marcus Johnson. 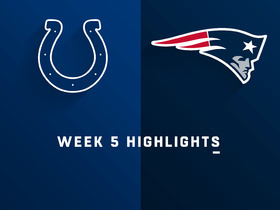 Grant brought in six of nine targets for 58 yards in the Colts' 38-24 loss to the Patriots on Thursday. Analysis: With both T.Y. Hilton (hamstring) and Jack Doyle (hip) sidelined, it was up to Grant and Chester Rogers to take on a large portion of the workload in the passing game. The veteran slot man did his part, posting season highs in both receptions and targets. Grant's 9.7 yards per reception was his lowest of the season thus far, but he's now seen his target total climb for three consecutive weeks. He'll look to continue offering serviceable PPR production against the Jets in Week 6. Grant and Chester Rogers will serve as the Colts' top two wide receivers while T.Y. Hilton (hamstring) is held out for Thursday's game in New England, Mike Wells of ESPN.com reports. Analysis: Despite playing more than 70 percent of the Colts' offensive snaps every week this season, Grant has accounted for just 12.3 percent of his team's target total, averaging 4.5 catches for 47 yards on 5.8 chances per game. He doesn't offer a ton of upside as a possession receiver, but there's a clear opportunity for volume in a matchup that likely will force Andrew Luck to chuck the ball around once again. 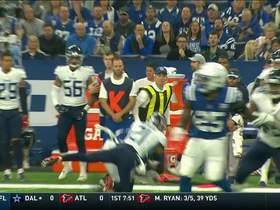 Grant nabbed five of seven targets for 64 yards Sunday in the Colts' 37-34 overtime loss to the Texans. 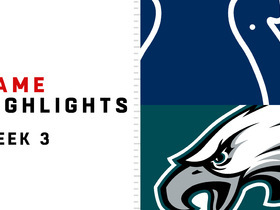 Grant nabbed three of four targets for 35 yards and a touchdown during Sunday's 20-16 loss to the Eagles. Grant had two receptions for 30 yards on two targets in Sunday's win at Washington. Analysis: Grant didn't repeat the heavy usage of Week 1 (eight receptions and nine targets), but he still played the second most snaps on offense (43 snaps) of a receiver after T.Y. Hilton (55). He also played significantly more snaps than third receiver Chester Rogers (26 snaps) even though Rogers had three receptions. Grant still looks like the No. 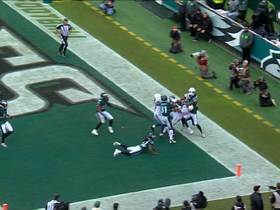 2 option, but no receiver after Hilton had more than three receptions Sunday. Grant caught eight of nine targets for 59 yards in Sunday's season-opening 34-23 loss to the Bengals. 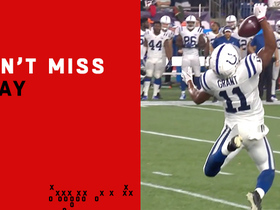 Analysis: Grant was Andrew Luck's target of choice underneath, with none of his gains going for more than 13 yards. Indianapolis aired it out 53 times in this one, so it's fair to question whether this workload is sustainable for Grant. That being said, he seems to have emerged as the team's second-best wide receiver after T.Y. Hilton. Grant had one reception for 17 yards on two targets in Saturday's preseason win over the 49ers. Analysis: Grant and Chester Rogers had the same number of snaps on offense, so it's not exactly clear how the playing time will be divided among wide receivers after T.Y. Hilton. By all accounts Grant won the No. 2 receiver role in training camp, but he had just one reception in three preseason games. Grant saw action on 34 snaps on offense in Monday's 20-19 preseason loss to the Ravens. Analysis: Though Grant did not haul in either of his two targets Monday, he was in the Colts' starting lineup. Grant is currently a favorite to remain there come Week 1 and thus set to work as the team's No. 2 wideout opposite T.Y. Hilton (shoulder). 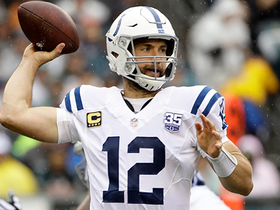 It's a context that could yield fantasy dividends for Grant investors if QB Andrew Luck -- who is bouncing back from a lingering shoulder issue -- is able to find his pre-injury groove. Grant did not have a reception and was not targeted in Thursday's preseason win at Seattle. However, he did work with the first-team offense as the No. 2 receiver. Analysis: We wouldn't read too much into his lack of stats in Thursday's game. He began the game out wide as the No. 2 receiver and all reports in training camp indicate he's got a solid lead on the role. With Andrew Luck looking healthy, Grant could be a sleeper as one of Luck's primary targets. Grant has started to separate himself from the pack in training camp and has become the clear leader for the No. 2 wide receiver role, Zak Keefer of The Indianapolis Star reports. Analysis: Grant, Chester Rogers, Deon Cain and K.J. Brent are the leading candidates for the No. 2 and No. 3 roles, which remain in flux during the preseason as it's a wide open battle. However, Grant appears to have the lead for the No. 2 job ahead of Thursday's first preseason game. Grant has received the most work as the No. 2 wide receiver in the first week of training camp, but he's not very far ahead of Chester Rogers, 1070 am ESPN Indianapolis reports. Analysis: Grant, Rogers and Deon Cain are the leading candidates for the No. 2 and No. 3 roles, which look wide open at the moment. The No. 2 and No. 3 receivers could have significant increased fantasy value in Indy's offense compared to last season, with Andrew Luck increasingly looking ready for the start of the regular season. Grant was working as the team's No. 2 wideout during Wednesday's OTAs, Zak Keefer of The Indianapolis Star reports. Analysis: Chester Rogers was initially considered the favorite to earn the No. 2 role opposite T.Y. Hilton, but it appears Grant may have moved ahead of him in the pecking order. There is still a lot of time before the regular season begins and the Colts have a number of players to get a look at during the preseason, but Grant has put himself in a good position for reps in the early going. Grant (ankle) is signing a one-year, $5 million contract with the Colts, Ian Rapoport of NFL Network reports. Grant (ankle) is reportedly nearing a deal with the Colts, according to Mike Chappell of Fox 59 News. Grant (ankle) passed a physical during his visit with the Colts on Saturday, Ian Rapoport of NFL Network reports. Analysis: Grant agreed to a four-year, $29 million contract with the Ravens earlier this week, but the deal was voided due to a failed physical. The 27-year-old is leaving Indianapolis without a contract, but the team passing him on the physical remains a good sign for his future prospects as the ankle injury doesn't appear to be a significant concern for each team. Next up for Grant is a visit to the Raiders, which could be looking to add some depth behind Amari Cooper and new addition Jordy Nelson. 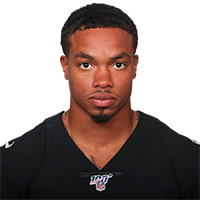 Grant's agent Rocky Arceneaux said Friday that the wideout would be able to play in an NFL game "tomorrow" even though the Ravens nullified his contract Thursday after examining his ankle, Adam Schefter of ESPN reports. Grant's four-year contract with the Ravens that was agreed to earlier in the week has been voided after he failed his physical on Thursday, ESPN's Adam Schefter reports. Grant is expected to signed a contract with the Ravens, Ian Rapoport of NFL Network reports. Analysis: Grant put together his best NFL season in 2017 with 45 receptions for 573 yards and four touchdowns. According to Rapoport, it is a four-year deal worth $29 million with $14.5 million guaranteed, as the Ravens clearly expect him to continue to improve in 2018. The 28-year-old looks to be Baltimore's top wide receiver at this point along with fellow newcomer John Brown, with Mike Wallace headed for free agency and Jeremy Maclin a potential cap casualty. Grant recorded career-highs across the board with 45 receptions for 573 yards and four touchdowns in 16 games this season. Grant hauled in four of six targets for 85 yards in Sunday's win over the Broncos. Analysis: Grant had arguably his best game of the season against a tough Broncos defense, recording two 20+ yard receptions on his way to a season-high 85 receiving yards. The No. 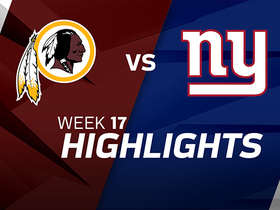 3 wideout will look to go out with a bang to end the season as the Redskins face a Giants' passing defense that ranks second-worst in the league in yards allowed. Grant recorded two receptions for 20 yards in Sunday's 20-15 win over the Cardinals. Analysis: Since a five-reception performance Week 13, Grant has only managed three receptions for 48 yards on four targets. The wideout was limited the entire week of practice with an ankle injury, which may have been a factor in his quiet performance Sunday. He'll look to get back on track this Sunday against the Broncos, who boast one of the best passing defenses in the league. Grant (ankle) is active for Sunday's Week 15 tilt against the Cardinals. Analysis: The 26-year-old wideout will be out there after putting in a trio of limited practices this past week. Grant logged one reception for 28 yards versus the Chargers in Week 14, but he's posted between three and a season-high five catches in 10 other contests this season. Therefore, he's capable of offering modest production to fantasy owners in deeper formats who might find themselves in a pinch at receiver during the fantasy postseason. Grant (ankle) is listed as questionable for Sunday's game against the Cardinals, John Keim of ESPN.com reports. Analysis: Grant injured his ankle in last week's 30-13 loss to the Chargers, finishing with one catch for 28 yards on his only target. His ability to practice in a limited capacity throughout the week suggests he's on the right side of questionable for a tough matchup against the Cardinals. While efficient with a limited workload, Grant has drawn more than three targets in just one of six games since the end of October. Grant (ankle) was listed as a limited participant in practice Wednesday, Mike Jurecki of Arizona Sports 98.7 FM reports. Analysis: Grant came out of Sunday's loss to the Chargers with the ankle issue, but his participation in practice Wednesday in any capacity bodes well for his outlook heading into the Week 15 matchup with the Cardinals. If cleared to suit up for that contest, Grant, who was limited to one catch for 28 yards against Los Angeles, would likely serve as the Redskins' No. 3 wideout. Grant suffered an ankle injury in Sunday's 30-13 loss to the Chargers. Analysis: Grant played 30 of 50 snaps in Sunday's game and never officially exited with an injury, but head coach Jay Gruden indicated he is currently considered day-to-day. The 26-year-old's status for Week 15 should become clearer when the Redskins resume practice Wednesday. Grant brought in his sole target for 28 yards in Sunday's 30-13 loss to the Chargers. Grant brought in five of eight targets for 76 yards and a touchdown in Thursday's 38-14 loss to the Cowboys. 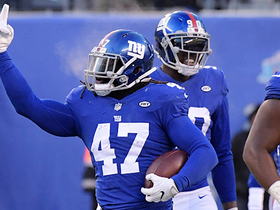 Grant hauled in one of his two targets for three yards in Thursday's win over the Giants. Analysis: Grant was questionable coming into the contest with a calf injury, which may explain the wideout's quiet performance. Before Thursday night, Grant had at least three receptions in every contest since Week 4. After getting some extra rest this weekend, he should be in much better shape for Thursday's showdown with the Cowboys. Grant (calf) will play Thursday against the Giants, Adam Schefter of ESPN reports. Analysis: Now that Terrelle Pryor (ankle) has been placed on injured reserve, Grant should see an increased role. However, it's thought that he may be limited Thursday in the wake of his recovery, so fantasy owners outside of deeper leagues should tread lightly. The fourth-year wideout has 30 receptions for 338 yards and three touchdowns this season. Grant (calf) is listed as questionable for Thursday's game against the Giants. Analysis: Grant was limited in practice throughout the week after sustaining a calf injury in Sunday's loss to the Saints. While Grant looks like he'll be less than 100 percent healthy for the Thanksgiving Day matchup, the expectation is that he'll suit up in the contest and take on a healthy snap count with Terrelle Pryor (ankle) landing on injured reserve earlier this week. Grant (calf) was a limited participant at practice Tuesday. Analysis: Grant picked up the calf injury in Sunday's 34-31 loss to the Saints, during which he finished with three receptions for 59 yards and a touchdown. 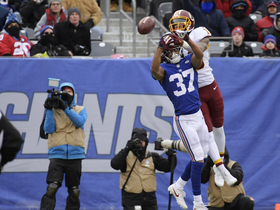 The wideout's participation in practice to some extent two days later suggests the calf issue isn't a major concern, but Grant's status bears watching with the Redskins facing a quick turnaround for their Thursday night matchup with the Giants. Grant (calf) is listed as a limited participant on Monday's injury report for Thursday's game against the Giants. Analysis: Grant returned from a concussion to catch all three of his targets for 59 yards and a touchdown in Sunday's 34-31 loss to the Saints. He apparently picked up a calf injury along the way, but the Redskins' decision to list him as limited suggests he's on track to take the field on Thanksgiving. Grant, Jamison Crowder and Josh Doctson have been operating as Washington's regular trio in three-wide formations. Grant (concussion) caught all three of his targets for 59 yards and a touchdown in Sunday's 34-31 overtime loss to the Saints. Analysis: Grant's 40-yard touchdown catch in the third quarter gave the visitors a 24-13 lead, and that advantage eventually ballooned to 31-16 before New Orleans staged a comeback in the final minutes. The 26-year-old wide receiver has scored three touchdowns this season, but Grant's season high in yardage has remained at 61 since he accrued that total in Week 1. Grant (concussion) is active for Sunday's game in New Orleans. Analysis: After suffering a concussion last Sunday against the Vikings, Grant's availability was at the behest of the league's protocol for head injuries. Given clearance to play, he'll earn a third consecutive start with both Terrelle Pryor (ankle) and Brian Quick (concussion) unavailable Week 11. Grant (concussion) is listed as questionable for Sunday's game in New Orleans. Grant (concussion) was a limited participant in practice Thursday. Grant was placed into concussion protocol after Sunday's game against the Lions. Analysis: Grant has been targeted 36 times this season, hauling in 27 receptions for 279 yards and two touchdowns. On top of that, he's been targeted six times in the red zone, making him worthy of fantasy consideration in deeper leagues. If Grant can't recover by Week 11, Maurice Harris and Brian Quick (concussion) could handle larger workloads than normal. Grant has been ruled out for the remainder of Sunday's matchup with the Vikings after sustaining a concussion, JP Finlay of NBC Sports Washington reports. Analysis: Grant was taken out of the game earlier and evaluated for a concussion, but he was put back into the game after being cleared. He's now officially out the the rest of Sunday's contest, though, so Maurice Harris will slot in as the No. 4 wideout for the rest of the afternoon. Grant hauled in all three of his targets for 39 yards in Sunday's win over the Seahawks. Analysis: With Jamison Crowder (hamstring) sidelined for Sunday's win, Grant saw his highest offensive snap count of the season (59). The depth wideout is averaging three receptions per contest this season but could see more action this Sunday against the Vikings if Crowder is ruled out again. Grant is expected to step in as the slot receiver after it was announced that Jamison Crowder (hamstring) will not play Sunday against Seattle, Rich Tandler of NBC Sports Washington reports. Analysis: Grant, who is coming off a season-high five catches and seven targets in a loss to the Cowboys, should set a new high in playing time against Seattle, whose defense dropped to 12th against the pass after it was lit up in last week's win over Houston. The 26-year-old has caught 21 of 30 targets (70 percent) for 215 yards (10.1 yards-per-catch) and two touchdowns over seven games.